Nearly 530 alumni and guests gathered at The Pierre for the 39th Annual Haskins Giving Society Award Dinner, a celebration to honor NYU Stern’s most generous donors and their commitment to the School. It was the largest dinner in the history of the event. Guests included many members of the Stern Alumni Council, the Stern Board of Overseers, and NYU’s Board of Trustees, including the Chair William Berkley (BS ‘66). 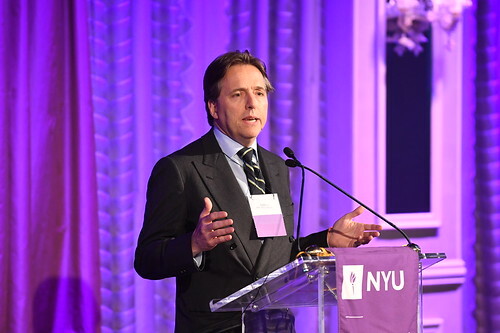 This year’s Haskins award was presented to NYU Board of Trustees member, Andrea C. Bonomi (BS '86), chairman and founder of Investindustrial, a leading European private equity group. Andrea's philanthropic commitment to the University is exemplified through the establishment of the Bonomi Family Admissions Center and his leadership support of NYU Stern’s Center for Sustainable Business. Stern Board of Overseers Chair, Alison Mass (BS '80, MBA '81) welcomed guests and introduced NYU President Andrew Hamilton, who delivered opening remarks and recognized the impact that Andrea has made on NYU and Stern. Dean Raghu Sundaram shared exciting innovations happening at Stern, and thanked Haskins donors for their generous support. In his acceptance remarks, Andrea expressed his gratitude for the award, his pride in Stern's growth, and how proud he is to be part of the NYU community.